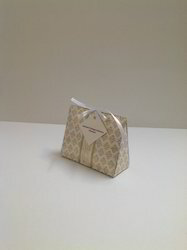 We are a manufacturer of CardBoard Gift Pouch in chennai, tamilnadu. We are among the leading manufacturers and suppliers of various Cardboard Gift Pouch in Chennai. Our products are provided in vibrant colors and designs, these can be availed by our clients in the following shapes as per their requirements. Looking for CardBoard Gift Pouch ?